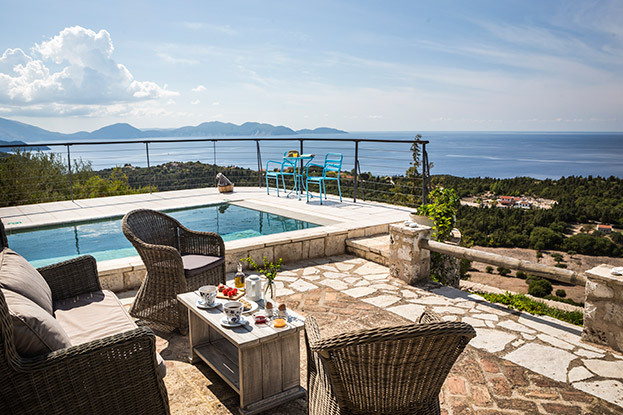 Set on a panoramic hillside, it offers outstanding views and an expansive vantage point of the Ionian sea and sunset. Designed exclusively for unforgettable moments. Ranzo ionio apartments & studios is a new vacation destination in Tzamarelata village, located in northern Kefalonia. Set on a panoramic hillside, it offers outstanding views and an expansive vantage point of the Ionian sea and sunset. The traditional style is dominant through out the architecture and interior decoration. You will feel right at home with the family hospitality and local cuisine. These awards truly represent the voice of the customer. We have been on a journey to exceed our guests’ expectations, and clearly our hotel is achieving incredible results. Decorated in light tones, all units include a 32” flat-screen, satellite TV, air conditioning and mini fridge. Kefalonia is one of the most popular destinations in Greece, particularly famous for its gorgeous beaches, traditional villages, natural beauty and hospitality of the locals.